Known mainly for college football, the Cotton Bowl has been the home of two NFL franchises during its existence. Throughout its history, the primary tenant of the stadium was the SMU Mustangs (NCAA). In the late 1920s, the team needed a stadium for its games. A stadium near downtown Dallas was constructed in 1930 at a cost of $328,000. 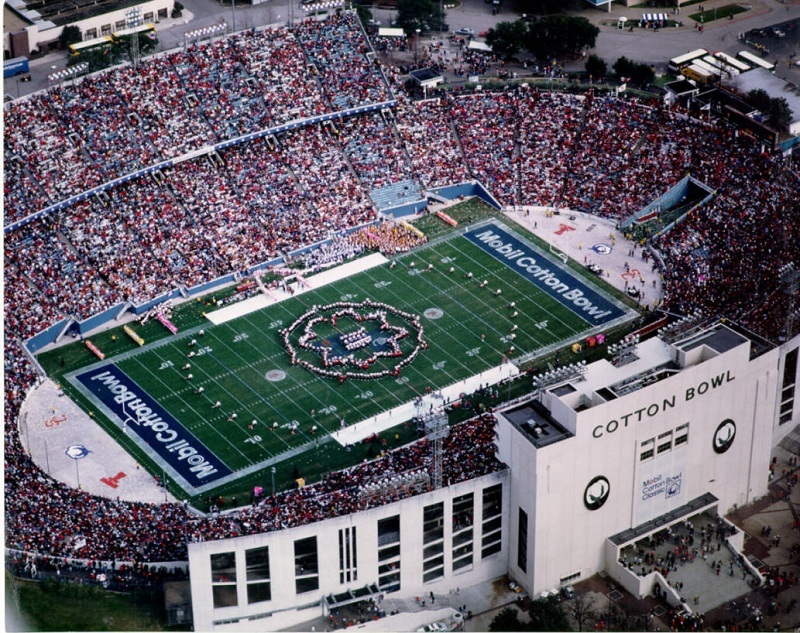 Named the Cotton Bowl, it had a capacity of around 45,000. The Mustangs played the first game at the Cotton Bowl in 1932. Throughout its existence the stadium’s seating capacity has been increased many times, the most during the 1940s when the capacity was increased to over 60,000. In 1960, the creation of the AFL put a team in Texas, the Texans. The NFL also expanded into Texas creating the Cowboys. The Cowboys played their first game at the Cotton Bowl on September 24, 1960. The Texans played at the Cotton Bowl for three years before moving to Kansas City and becoming the Chiefs. The Cowboys played at the Cotton Bowl until 1971 when they moved to Texas Stadium. Renovations to the Cotton Bowl in 2008 expanded the seating capacity to over 92,000 by encircling the upper deck. The $50 million renovation also included replacing all the seats, a new pressbox, luxury seats, video/scoreboard, lighting and concession upgrades. The annual Red River Rivalry game between the Oklahoma Sooners and the Texas Longhorns continues to be played at the Cotton Bowl. However, the stadium has no major tenant.